UB continues to turn up the underground heat & the SWITCHED ON vibe just keeps building month on month. We are super hyped for this upcoming session which featuresâ€¦. 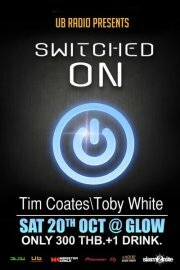 Switched On resident and party rocker â€“ TOBY WHITE â€“ keeping the pace and doing what he does bestâ€¦. SMASH the GLOW dance floor to pieces. Toby will be joined by one of our favorite late night DJâ€™s â€“ TIM COATES â€“ who never ever fails to deliver a mind-bending set worthy of any BIG club around the world. Join us for a night of ‘Switched On’ beats and a vibrant party people atmosphere, in the heart of Bangkok’s underground scene.